Mohawk’s production of the musical “Urinetown”: Performances are Friday, March 4 at 7:00 pm, Saturday, March 5th at 7:00 pm, and Sunday, March 6th at 2:00 pm. Tickets are $10 for adults, $5 for students/seniors, and Free for children 2 and under (on parent’s lap). For reservations: email mohawkmusicalreservations@gmail.com and leave your name, the date of the show you'd like to attend, and the number of tickets you'd like. Starting on Tuesday, February 23 you can also reserve tickets by phone at (413) 625-9811 extension 1364. The musical "Urinetown" imagines a future when access to public bathrooms is controlled by a wealthy few in an era of drought and income inequality. As a satirical musical with mature themes, "Urinetown" may be more appropriate for teenagers and adults than for younger children. A hub of activity in the “Urinetown” rehearsal process: dance rehearsals in one room, music rehearsals in another, acting rehearsals on the stage or even in the hallway; a mural taking shape on the auditorium wall; recently painted cubes on the stage, behind a tower being transformed by chicken wire, paint, and students' hands. What I love most about theater is its ability to create community. We are seeing that every day, in both the work we are making and in how students support each other in the process. I can't wait to share it with you - and hopefully inspire joy, laughter, and dialogue about the world that we share. 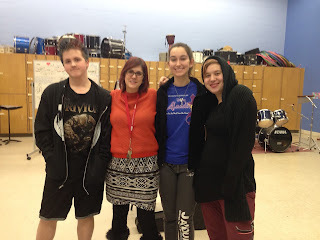 Ms. Clark on her last day at Mohawk with three students whom she has taught since pre-K: seniors Ethan Glover, Kylee Cole, and Cassie Kudlay. Thank you so very much for your continued support of the music department and your children throughout my 11 years at Mohawk. Your kids have been such an inspiration to me, and have made me the teacher that I am today. I will never forget my time at Mohawk and will cherish all of the wonderful memories Mohawk has provided me. I wish you all the best! To high school students and families: On my last day at Mohawk the HS students surprised me with a serenade in the music room as the day came to a close. Additionally, Citrus and the Fruitbowl also sang a song for me, and sang a tribute over the intercom so the whole school could hear. As I looked around the room at the talent and joy the high school students have of their singing, I felt so very proud to have been a part of so many students lives. Thank you so very much. I could not have asked for a more wonderful send off! Mohawk Music Association meeting at 6:30 pm in the library. All are welcome.